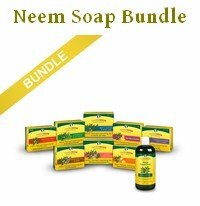 Neem Soap - What Is Neem Oil Soap And What Can It Do For You? What Is Neem Oil Soap And What Can It Do For You? 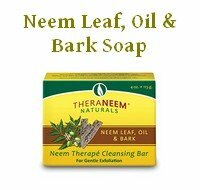 Neem soap is made from the oil of the neem tree. In India, 80% of all neem oil is used for making soap. The neem oil is the main ingredient of neem oil soap. It's not just an additive as essential oils are (think lavender or tea tree). Neem oil does form the basis of the soap. Neem oil soap is the most popular form of utilizing the many benefits of neem oil. Neem oil has insecticidal properties, is antibacterial and antifungal, soothing and moisturising... Neem oil soap is a real treat for the skin, even for healthy skin. But skin problems are where it shines. Here are just some skin conditions where people have used neem soaps (product link) for centuries and with great results. Follow the links above and below to find out more. But neem soap does also have draw backs, and some of them depend on how the soap has been made. The neem oil content in neem soap varies. Some manufacturers may use mainly cheap ingredients and just add some token neem oil. So don't buy just any soap that says "neem" somewhere on the label. To get the maximum benefit look for "maximum strength". 20% neem oil content is good. 30%-40% is about as high as you can go while still making usable soap, but it may actually be a bit strong for sensitive skin, and often it won't smell very nice. Here is an example of a good soap with 20% neem oil content. 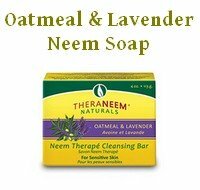 Soaps with somewhat less neem oil will still be beneficial. Some soaps also have neem leaf extract added. Both neem oil and neem leaf are great ingredients for any skin or hair care products. In fact, a soap that contains both would be excellent! Here is an example for a soap with 10% oil and added leaf and bark extract. As I mention on many other pages on this site, the best neem oil is organic, cold pressed oil. The alternative to cold pressing is solvent extraction. That's why a lot of the neem oil used in soap making has been extracted with solvents. And it may contain traces of those solvents. Like many chemicals, those solvents can cause allergies and other reactions in people. People may then blame neem oil, but as so often when people show sensitivities to skin products, it's one of the unpronounceable chemicals that's also in the bottle. If someone makes a quality handcrafted neem oil soap they most likely use quality ingredients. So will most people who specialise in quality neem products. So this is more of a risk if you buy a cheap, mass produced soap. Naturally, any products I link to on this site are from companies that specialise in quality neem products. Here is an example of another good soap, from a different manufacturer than the examples above. Read through the description and you see how the manufacturer stresses the use of organic, cold-pressed, solvent-free oil. If you do get a reaction, it's not necessarily the herb that's to blame. Do find out what else is in the product, or in the case of neem soap, what neem oil has been used and where it came from. 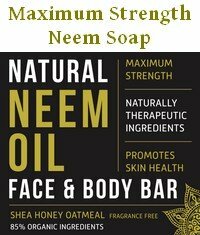 One other draw back that I already talked about on the page about the use of neem soap for acne is that any soap can dry the skin. It depends on the ratio of the oil to the other ingredients. It may help you to understand this better if you read through the page about making neem oil soap. Again, the lovingly handcrafted soaps are usually rich, mild and even moisturising. It's the cheap ones where you want to be a bit careful. Here is an example of a neem soap that is specifically formulated for dry, sensitive skin. So is this one, which I had already linked to above. And last but not least, there is of course the smell... Neem oil does not smell nice! Most neem companies that make soap also add essential oils to mask the smell of neem. Depending on how sensitive your nose is you may still be able to detect the neem smell when using the soap. Luckily the smell does not linger after rinsing the neem oil soap off and drying yourself. So if you want to do your skin some good, try neem soap!